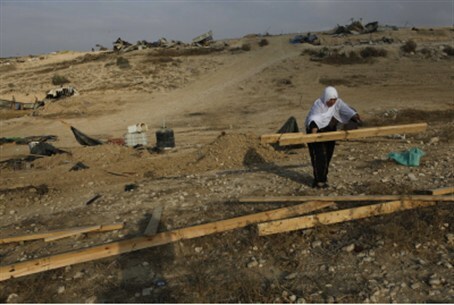 Cabinet will vote to hand over huge swaths of Negev land to Bedouins, in last-minute move. In a move nationalists find exasperating, the Likud government is about to vote Sunday to approve a land grab by Bedouins, based on the recommendation of Minister Benny Begin. Writing in Maariv, Kalman Libeskind says that the vote has the hallmarks of a last-minute move, timed for the first cabinet session after the elections, and before a new coalition has been formed. Government ministers received a 15-page document signed by Begin, which is supposed to be the basis for their vote. The document recommends settling the matter of disputed land grabbed by Bedouins over the years in a way that grants the Bedouins sweeping concessions. Libeskind notes that the government already accepted, in principle, recommendations to cede disputed land to the Bedouins, but that Begin's document goes even further than those recommendations and is also more generous than the Goldberg Committee appointed to examine the matter. Begin reportedly met with about 600 Bedouins, and with representatives of various leftist organizations that advocate in the Bedouins' favor. Maariv says that Begin recommended allowing the Bedouin to receive ownership of about 180,000 dunams of land (45,000 acres) that is registered in the name of the State of Israel. In addition, they will be eligible for 62.5% of land that they claim is their own, but for which they have no proof of ownership. Instead of receiving financial compensation for land claimed by the state, they can be compensated with alternative land, according to Begin's offer. Minister Begin was voted out of Likud's leadership by the party's rank-and-file in recent primaries. Many said that they were worried by his leftist tendencies and close connection to the circle that surrounds former Supreme Court president Dorit Beinisch. Land protection NGO Regavim filed a motion to the High Court to prevent the cabinet from voting on Begin's recommendation, but the court ruled against the motion. It instructed the NGO to file an appeal after the cabinet votes on the recommendation, if it accepts it.